Spacious and pleasant cottage with all commodities. Two identical rooms of about 15 m, mosquito nets, bathroom with shower, washbasin and WC. Air conditioning. TV / Canal Satellite - Wifi Equipped kitchen with a large 40 m terrace with dishes, refrigrateur, toaster, gas cooker, electric coffee maker, And for a nap ...... a hammock on the terrace! Really very warm welcome from the owners. Nice and quiet accommodation. The announcement suggests that the pool is private ... This is not quite the case. She is at the owners, next door. However, we had access to it at will. It lacks a living space, in addition to 2 bedrooms and open kitchen: evenings under a wind often strong enough are not very pleasant outside. Welcome home owners who came to pick us up to avoid looking for the (steep) road leading to the rental. Nice reports afterwards. Beautiful terrace with sea views, well appointed. We spent only 2 days in the rental, but it is with great pleasure that we will come back next time, and longer, I hope. Nickel rental and very friendly welcome from Michelle and Eric. Very friendly and warm welcome from Michèle and Eric. The description of the rental is fully consistent with the photos with a kitchen very well equipped and very nice (outside). Ideal starting point to visit Basse-Terre. Very pleasant stay that I recommend. Good warm welcome from Michele and Eric. Rental quite consistent with pictures and description. The jacuzzi was a +. very nice pool. Height hire, very quiet, very ventilated, not far from shops. We had a very pleasant stay with friends. We loved our stay in Guadeloupe! We are happy to have rented this cottage because the location was perfect as we (quiet area, lush, authentic, with beautiful small beaches nearby). In addition, the welcome was warm, friendly and Eric and Michelle really work on trust, without the fuss. In short, definitely return one day ... well, hopefully! Overall pleasant rental. Although we have had access to the pool, however we regret that it is not adjacent to the rent but home owners. Warm welcome. Easily accessible and close to the sea, the cottage is cozy and comfortable, very nice terrace overlooking the sea. Thank you to Eric and Michelle for their kindness and availability. We enjoyed and hope to return! Cosy accommodation on the heights of the Beaugendre Valley. 5 minutes from the beach of Petite Anse and 15 minutes from the beach Malendure the Cousteau reserve. Perfect location and very functional, clean, spacious, favorite for the terrace area, complete relaxation and well equipped new kitchen, very friendly, discreet and dedicated proprios. We had a great stay and the owners are friendly, helpful and very friendly. A place quite charming and relaxing. Very nice owners, and we expect a long weekend to have the pleasure to return without hesitation! Quiet and relaxing. 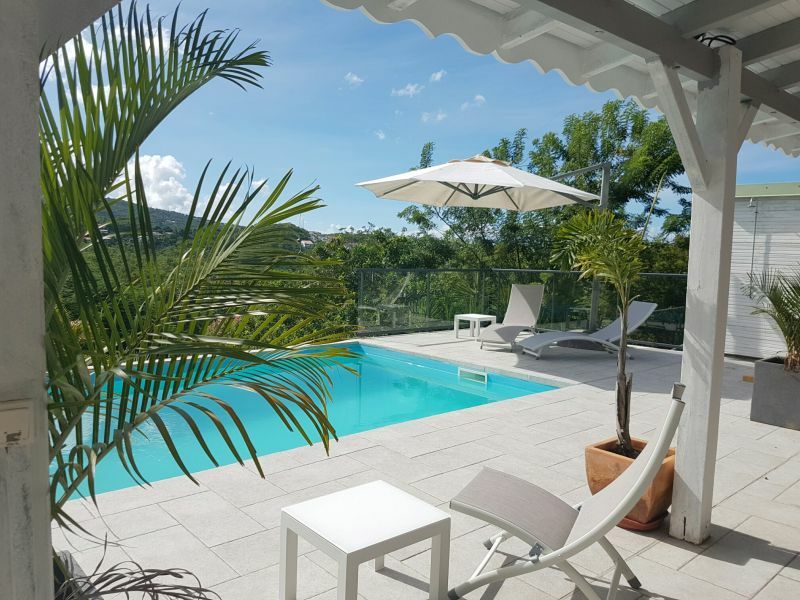 Very good place to spend a nice stay in Guadeloupe. The cottage is convenient and has a lovely terrace with a beautiful view of the mountains and the Caribbean Sea. Very warm welcome from the owners Michelle and Eric. We have already spent 2 stays of 2 weeks (2008 and 2009) and plan to return in 2010 with great pleasure. Mr Eric & Michelle M.